My goodness... it's like I almost don't even have a blog anymore. I'll admit that now that I am working, life has pretty much taken over. Leaving almost no time to cook or bake anything that hasn't already been made a million times before. And even less time to blog. Bear with me ;) I will most certainly get the cooking bug back again one day (maybe when the kids turn 18???). 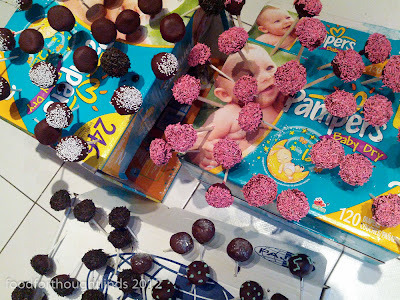 Before it gets too outdated though, I wanted to share a cake pop tutorial with you. Remember this post here? 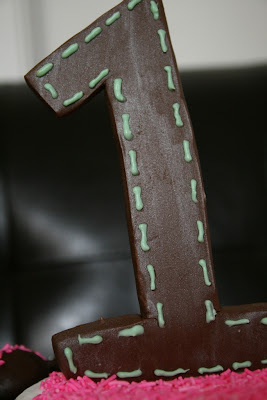 My little baby's first birthday party? This was my first stab at cake pops and I wanted to share how to make them for all of you who were inspired to one day make cake pops. While daydreaming up ideas for my baby's first party, I conjured up a beautiful fondant decorated cake in my head that I was going to make for her. 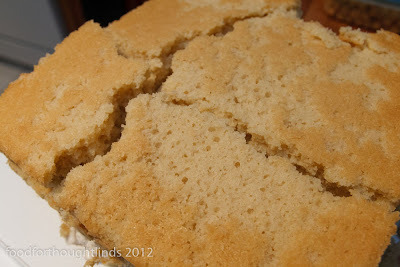 So off I went, testing gluten-free cakes, trying to find one that would be dense enough to hold fondant. And then I just gave up. I didn't have time to keep making failed cakes. And really, we couldn't eat them faster than they were going bad, so it all just seemed like a waste. The cakes tasted good, but they were just too crumbly to make anything with. 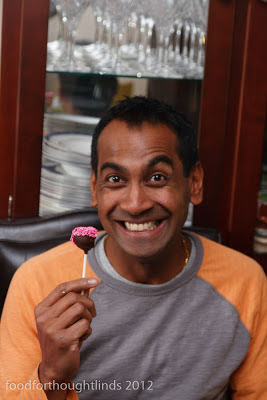 So cake pops it was. The best thing about cake pops is that it doesn't really matter if your cake is crumbly. They still work. 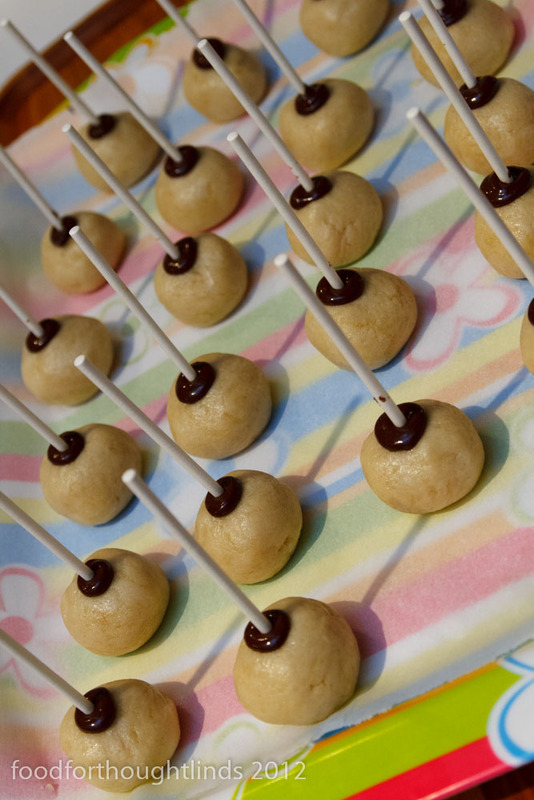 To make yourself a batch of cake pops, you basically just need some cooked cake and icing. Plus, some sucker sticks, such as the ones you can find at Bulk Barn. And then whatever decorations you want, such as different sparkles, etc. In order to save some mass time at a super busy time in my life (I'd also just started back to work! ), I opted to use Better Crocker's new chocolate gluten-free cake mix, which also just happens to be dairy-free. I can't believe I am admitting to this in writing! But it's a true story. I then mixed in my peanut butter frosting, substituted with sunbutter instead, for all of the allergic folk at her party. For the vanilla ones, I used this gluten-free recipe here. 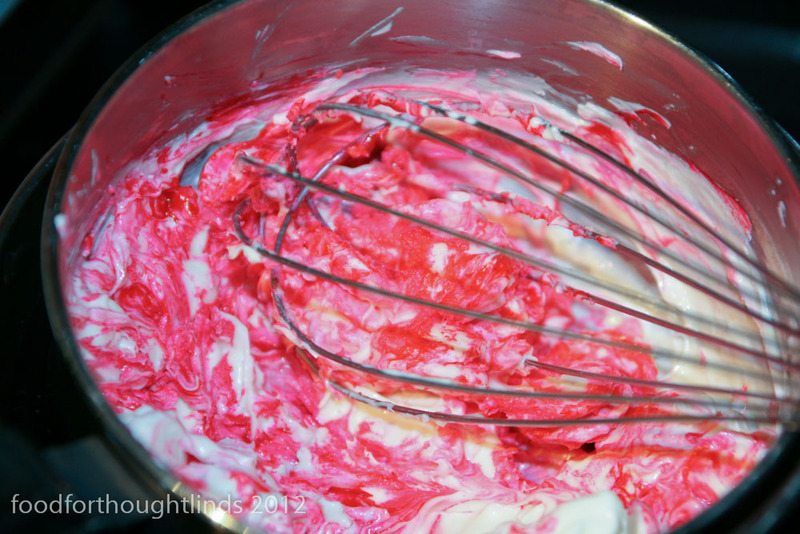 I then just made a plain old buttercream, using this recipe. Plus, I stirred in a bit of pina colada flavouring to make them that much yummier. 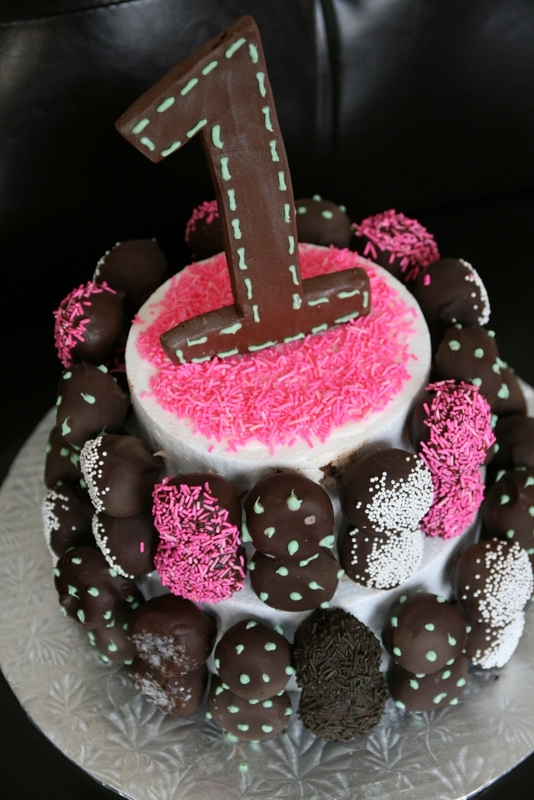 For those lucky ones out there who are not gf and don't have their own favourite cake recipes, you could use my pound cake recipe or the chocolate cake that I made for Logan's first birthday to make these. Though they are a little bit time intensive, cake pops are actually much easier to make than they look. You basically just crumble an already baked cake into a bowl and then stir in some icing to moisten it. You want to be sure to not mix in too much icing, so start slowly. It's also best to mix with your hands, so you can get a real feel for how moist the mixture is. 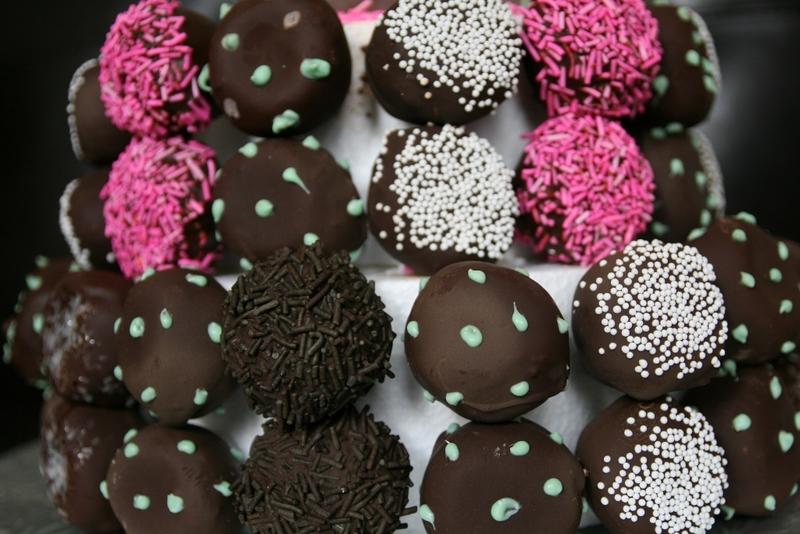 You want it to be a texture that can be easily shaped into balls without it being mushy. Once you've got the perfect texture, you can start shaping the cake mixture into little balls. I'd recommend not making them too big for a couple of reasons. Firstly, because the bigger they are, the heavier they will be. Hence, the higher the chances that they'll end up falling off of their sticks. Secondly, and much more importantly, the smaller you make them, the more of them you will be able to eat before you start to feel sick ;) Plus, the higher the chocolate to cake ratio, which is clearly also important. 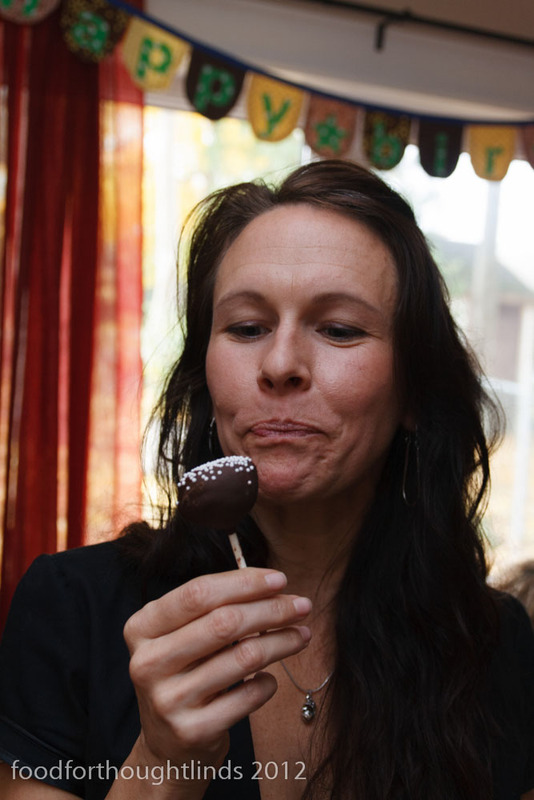 Once the chocolate is melted, dip one end of the sucker stick into the chocolate and then put it into your cake pop. 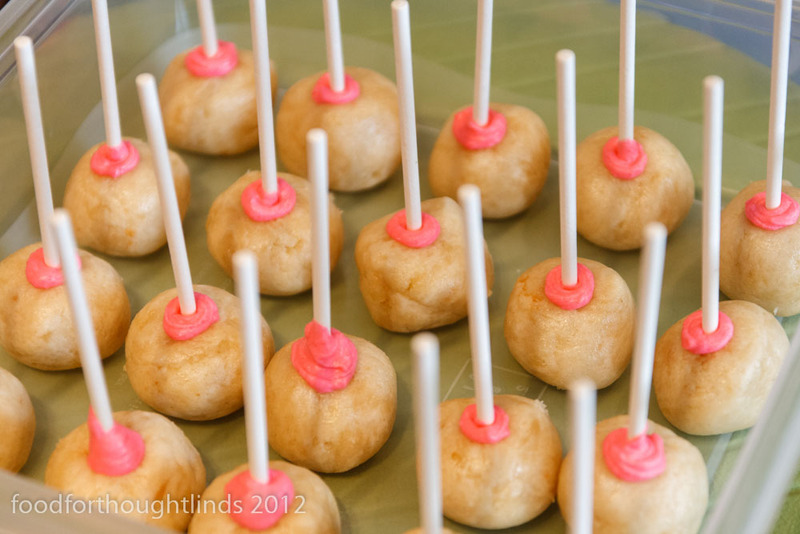 Your cake pops will look best if you can avoid pushing the stick all the way through to the other side - at the same time, be sure to put it in far enough that you won't lose your cake pop. When you are ready to decorate your cake pops, prepare your decorations prior to coating your cake pops in chocolate. Again, melt your chocolate using a double boiler. 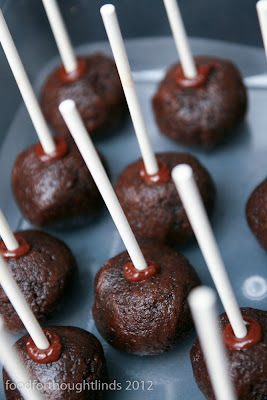 Take the cake pops immediately from the freezer and dip into the melted chocolate. Shake off excess chocolate by gently tapping the sucker stick on the edge of the pot. If using sprinkles, you can dip the cake pop into the sprinkles immediately, or shake sprinkles over top. Then place upright into a small hole in a box to dry. I used mostly diaper boxes, which I had pre-cut little holes into with a sharp knife. 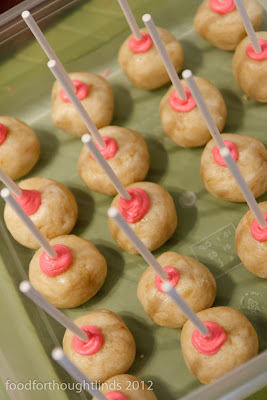 This makes it much easier to slide the sucker sticks into the hole without ruining your beautiful cake pop. Be sure to leave enough room between cake pops so that they don't end up touching. Let the cake pops sit in a cool space (I used my unheated office) for several hours to set. 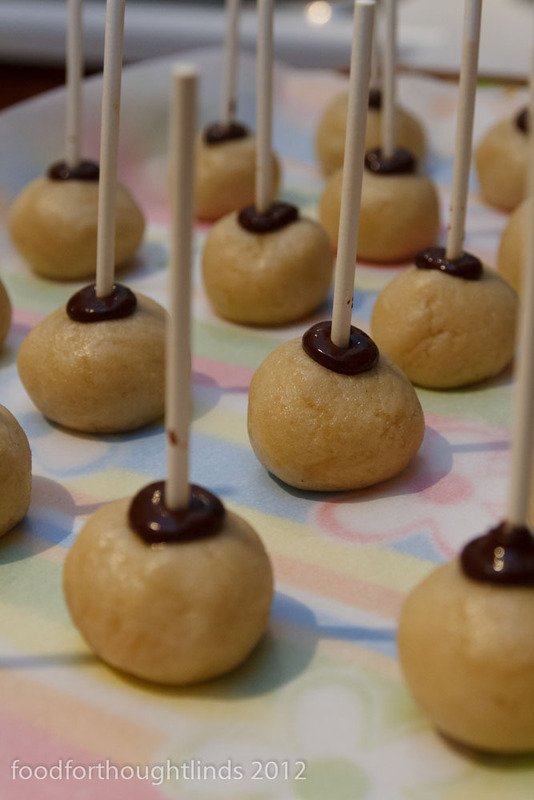 If you're having any problems with your cake pops, you can check out this post here, which walks you through solutions to some of the most common cake pop issues. 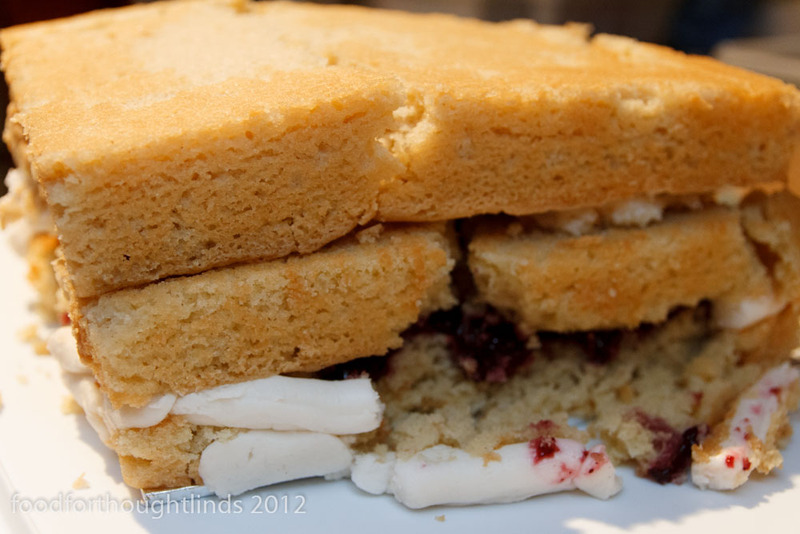 Next comes the tricky part... assembling the cake. This was much more difficult than I had thought. I bought two cake dummies from Bulk Barn and assembled them using some royal icing, so that they wouldn't slip all over the place. 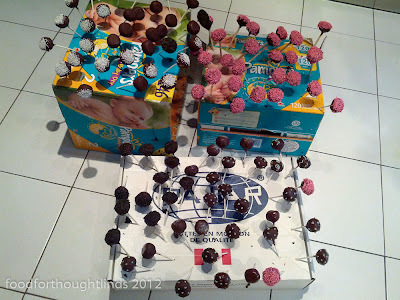 Once that had dried, I got to work trying to insert the cake pops into the styrofoam dummies. Not so easy. I used an empty sucker stick to poke holes in the styrofoam in advance, but still kept cracking cake pop after cake pop. And man, oh man, my hands were getting sore!! I should have worn a thimble. 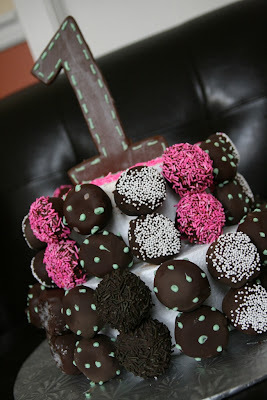 At one point, I got fed up and we even got out the drill to try to drill holes into the sides of the cake dummy. But we sadly did not have the right sized bit. So off I went, one by one, jamming those darned sucker sticks into an unrelenting styrofoam dummy. I was still at it when my parents showed up at 11pm!!! But I lived to tell and I was pretty impressed at how the cake looked in the end. Next time 'round, I'll be sure to have a proper sized drill bit and pre-drill all of the holes. That should make it a cinch to put one of these together next time for all to enjoy. So there you have it, folks. Though this takes a bit of time to make and assemble, it's a relatively easy way to make a fairly impressive looking cake.